Quilt in a Day it's "El"ementary Quilting Tips & Techniques. Eleanor Burns loves to quilt! Eleanor Burns loves to teach! 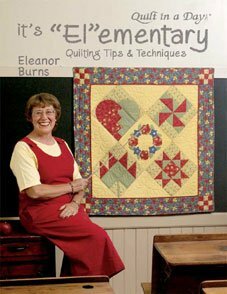 In her new book It's "El"ementary, she combines her talents to bring you a teaching quilt book! The book includes five 12" quilt blocks that form together in a delightful sampler wallhanging. Sew along with Eleanor to learn new methods for quick traditional quilt blocks. Step by step illustrations and instructions are offered for strip piecing, applique, flying geese patches, half-square triangles, and quarter square patches. "El"ementary offers two sampler layouts, a square sampler on point, and a vertical sampler. Once you know the techniques, it is time to make a larger quilt using the newly acquired skills. Full yardage and cutting charts are provided for all five quilt sizes for all five block patterns. To finish your quilt, learn about adding outside borders, folded borders, and nine-patch corners. Instruction is given for preparing the quilt backing, layering the quilt, pinning, machine quilting and binding. As a challenge for seasoned quilters, instructions, yardage and cutting charts are included for 6" blocks to miniaturize the designs.